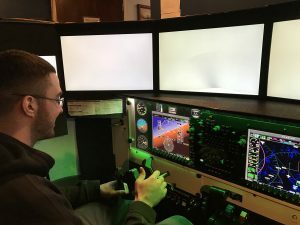 The Redbird LD Flight Training Device (also referred to as a simulator) is an FAA approved flight training device (FTD). It is a vital tool for instrument training, especially since it is very cost-effective. We have 3 set-ups: dual GNS430s, G1000, or Cirrus Garmin Perspective. The LD has features such as 200 degree wrap around display, and a WORLDWIDE terrain and airport database!